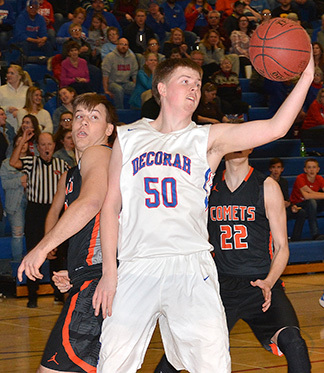 Coming up with two wins in the final week of the regular season, the Decorah boys’ basketball team (9-12, 5-7 NEIC) looks poised to make a run in the postseason. Three double-digit scoring efforts led Decorah to a 61-51 victory over Charles City (12-7, 7-5 NEIC) Tuesday night at home. It was close through the opening of the Friday’s home game, with neither team going up by more than three. At the quarter break it was Charles City on top, 15-13. In the second, Decorah played strong defense and kept the game close at, 23-22, heading into the locker room. Halftime adjustments were key for Decorah as it took the lead in the closing minute to make the score 41-32, with eight minutes of play remaining. Both NEIC squads finished with a solid fourth frame, combining for 39 points as the Vikings knocked off the Comets. Charles Robinson was nearly unstoppable from the floor with 19 points. Logan Halverson wasn’t far behind with 11 to go with nine rebounds. Also in double figures was Sam Robinson with 10 points. The Vikings were looking to make it back-to-back wins as they traveled to take on Prairie du Chien Saturday. A fourth-quarter rally came up just short as Decorah fell, 58-55. Falling behind 27-19 by halftime, the Vikings didn’t give up and rallied in the second half. Facing a 45-31 deficit with one quarter remaining, Decorah came alive to outscore the Blackhawks, 24-13, coming up three points short. In double figures for the Vikings was C. Robinson with 17. Halverson collected a double-double with 15 points and 14 rebounds. The Vikings survived a tenacious Waukon Indian team (5-13, 1-10 NEIC) Tuesday, Feb. 5, on the road, securing the win in the closing seconds, 70-68. The Decorah boys’ basketball team will open the postseason Monday, Feb. 18, at 6:30 p.m. at Webster City. The winner will face the winner of Charles City and Iowa Falls-Alden Thursday, Feb. 21, at the highest remaining seed at 7 p.m.